Magarini pastor on the run after residents demolish church – Kenyatta University TV (KUTV). All Rights Reserved. 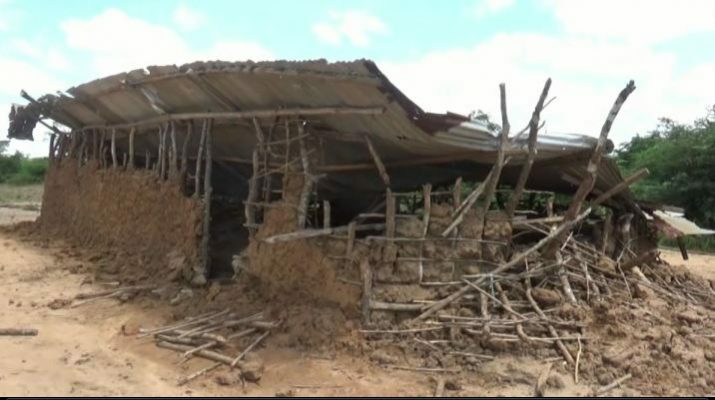 Irate residents of Bungale area in Magarini sub-County of Kilifi County have burnt down a house and demolished a church belonging to a pastor associated with a controversial Malindi Televangelist alleged to be preaching radical teachings. The angry residents allegedy led by ‘Nyumba Kumi’ leaders, together with peace ambassadors with the blessing of the local chief first descended on the church and destroyed everything. Later the resident’s ambushed pastor Titus Katana of Good News International Ministries’ house located 50 meters from the demolished church at Majengo ya Wakala area and burnt it. Nothing was saved from the destruction. They also threatened to kill the pastor for promoting radical teachings to the locals and asked him to ‘keep off’ the area or face serious consequences. Pastor Titus’s church is linked to controversial Malindi televangelist Paul Makenzi of Good News International Ministries church which has faced criticism from other church doctrines, politicians and government officials for spreading radical messages to followers. The church is said to be opposed to formal education and against medical care . Currently the pastor with his nine months expectant wife have sought refuge at relatives in Malindi fearing for their lives. Speaking on phone the DCC said the locals took the action following claims that the pastor is indoctrinating locals with false Christian teachings which are promoting extremism among followers. Earlier he said residents demonstrated against the pastor and demanded his church be closed but the church minister went on with his normal preaching’s. Locals told journalists that the pastor has been preaching against education and medical care making his follower believe that it is evil. Pastor Katana accompanied by his wife to their leader Televangelist Makenzi in his church where he said his life was in danger after the attacks. Addressing journalists at the church in Malindi Katana said he incurred losses amounting to over sh. 2.5 million after the destruction and burning of his church and building. He blamed the area chief, his assistant, village elders and Nyumba 10 elders for inciting locals to destroy the church and his house. The pastor said on the material day he was summoned to the chief by angry residents who then ordered him to go to the assistant county commissioner only to go back to destroy his property. “My life is in danger my followers are also not safe, Am surprised that the same authorities who are supposed to protect me are the ones inciting locals to evict me and destroy my property,’’ he said. Currently he said they have become internal displaced people and do not know how they will manage their properties back home. The wife who is nine months pregnant said the incident left her in shock and had to flee to safety in Malindi to avoid being lynched. Last year she said the same local leaders organized for her arrest and detention but was later released. The pastor accused the government officials and local politicians for contributing to his troubles. He said already there was another matter pending in court and wondered why there are people trying to push for his eviction and that of branches .Security personnel raided his church last year and arrested him with his followers for promoting radical preaching’s . He was later charged with promoting radicalism and teaching children in an unregistered school at the church and was released on a Sh. 500,000 bond with a surety of a similar amount.